Hotel Duo in Prague is a newly redesigned 4 star complex that offers to its guests a wide range of quality services – accommodation, dining, conference and sports center services. 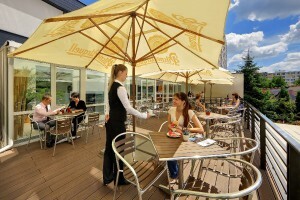 Hotel is located opposite the Střížkov metro station and the direct route to the city centre takes 12 minutes. 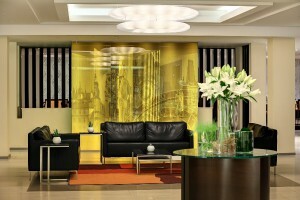 In total hotel offers 642 air-conditioned rooms in different categories with WI-FI connection. Stylish Formanka Restaurant specializes in traditional Czech and International cuisines and offers dishes of the finest flavors. Flexible hotel conference center has a congress hall up to 410 people and 10 smaller meeting rooms equipped with the modern technology. During the summer months guests have a summer terrace and garden at their disposal. Hotel sports center offers a wide range of services – bowling center with 12 alleys, swimming pool, sauna, gym, massages and beauty salon. There is a large capacity parking for 200 cars and 14 buses on the hotel side.